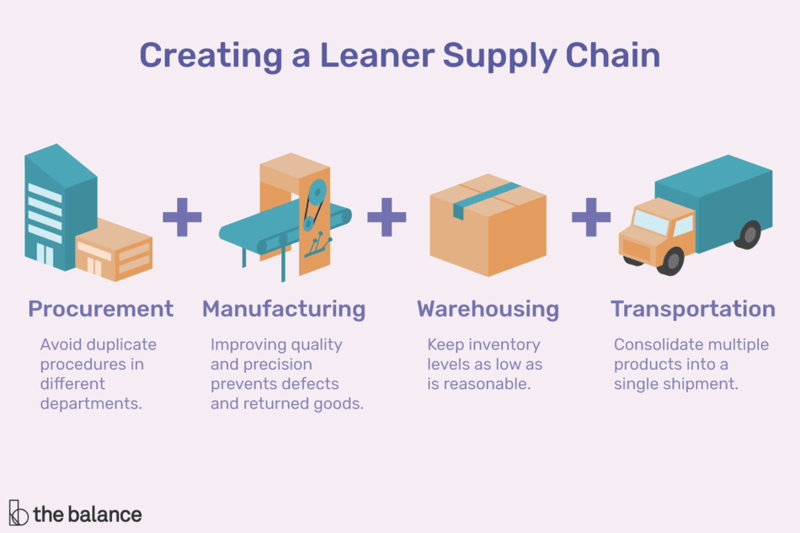 Lean supply chain management is not exclusively for those companies who manufacture products, but by businesses who want to streamline their processes by eliminating waste and non-value added activities. Companies have a number of areas in their supply chain where waste can be identified as time, costs, or inventory. To create a leaner supply chain companies must examine each area of the supply chain. Procurement involves developing a long-term strategy for supply chain and purchasing needs, which includes supplier contracts, market research, analyzing the value, and quality of the suppliers. Many businesses have complex purchasing operations because they believe that their purchasing needs are complex, but this is not always true. Large companies often have corporate purchasing groups as well as local purchasing, which means that their headquarters may have a purchasing department that dictates policy to the local purchasing groups. Quite often, the purchasing function at the corporate headquarters is duplicated, at least in part, at the lower level resulting in a waste of resources. By having two purchasing departments, corporate and local, vendors can often receive conflicting information. Vendors might be given different contracts, one from corporate central as well as local contracts that can lead to variations in prices depending on location. The various information from multiple locations can cause multiple records to be stored in computer systems. As a result, employees might not know which vendor is the one that they should use for a particular order or which contract is accurate. Overall, multiple purchasing departments can lead to significant confusion and waste within the organization. The companies that practice lean supply chain management reduce their procurement function so that each vendor has one point of contact, one contract and offers one price for all locations. Businesses are looking to new technologies to assist them in improving procurement processes. These include internet-based purchasing that allows requisitioners to purchase items from vendor's catalogs containing company-wide contract prices. Changes in payment options to vendors can also streamline processes. Companies that use a two-way match, which is payment on receipt rather than payment on an invoice can reduce resources in their purchasing department as well as improve supplier relationships. Lean supply chain management gained popularity in the manufacturing area, as this is where significant improvement can be achieved. Manufacturing processes can be improved to reduce waste and resources while maintaining operational performance. Quality is an important part of lean manufacturing. Having zero defects in the manufacturing process reduces waste and increases efficiency within the organization. With greater quality, customers will no longer return goods, which means fewer resources will be needed for returns and quality issues. Companies who have adopted lean supply chain practices have examined each of their routings, and their bills of materials, which is an extensive list of raw materials, components, and assemblies required to construct, manufacture or repair a product or service. Also, analysis of equipment is necessary to identify where improvements can be achieved. Warehouse processes should be examined to find areas of eliminating waste of resources and non-value added steps. Inventory control management is one of the most effective measures in reducing costs. The accumulation of inventory requires money and resources to store and maintain it. By reducing unnecessary inventory, a company can minimize warehousing space and handling, resulting in lower overall costs. Businesses who want to implement lean processes often look to their transportation procedures to determine if there are any areas that can be streamlined. In many instances, companies find that their efforts to improve customer satisfaction leads to poor shipping decisions. Orders are shipped without combining additional orders, which would minimize shipping cost. Also, companies sometimes use multiple shipping companies unnecessarily. By reducing the number of shipping options, the costs associated with shipping can also be reduced. Lean supply chain management requires businesses to examine every process in their supply chain and identify areas that are using unnecessary resources, which can be measured in dollars, time, or raw materials. The analysis can improve a company's competitiveness, its customer service, and the company's overall profitability.